Years ago, when I was young and reckless, I backpacked solo through Syria. One morning, at the bus station in Homs, I had to make a spur of the moment decision; I could go west, towards the sea and Lebanon, or I could go east, to the ancient city of Palmyra. I turned west. I never saw Palmyra. The 2000 year old city is now in the hands of ISIS. Years ago, when I was young and reckless, I backpacked solo through Syria. One morning, at the bus station in Homs, I had to make a spur of the moment decision; I could go west, towards the sea and Lebanon, or I could go east, to the ancient city of Palmyra. I was feeling low, constipated, lonely. 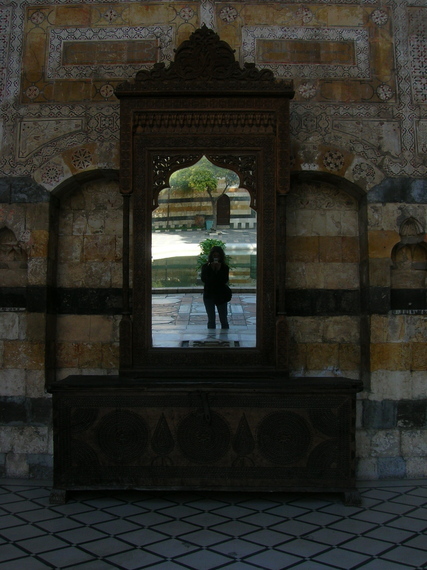 Syria was a challenging place to travel even then, particularly when you're alone and female. I turned west. I never saw Palmyra. The 2000 year old city is now in the hands of ISIS, who have shown their inhumanity in the wanton destruction of priceless artifacts across the Middle East. I could never have known, that cold and drizzly morning, that a cultural jewel like Palmyra could cease to exist. How could I have known that would be my only chance. Most of us endeavour to live a life without regret, and this decision will forever be one of mine. While Palmyra's fate still hangs in the balance, there are other treasures that are already gone, but ones I was lucky enough to see and experience first hand. This story is a snapshot of what I saw, what I felt, and what you'll never get a chance to know for yourself. Mid-winter, 2006, a week after my 23rd birthday, I cross the Turkish border into Syria, heading for the country's second largest city, Aleppo. I feel like I'm embarking on a true adventure, going places my friends and family are unlikely to follow me. Little do I know that nine years later following in my footsteps won't just be audacious, it will be impossible. 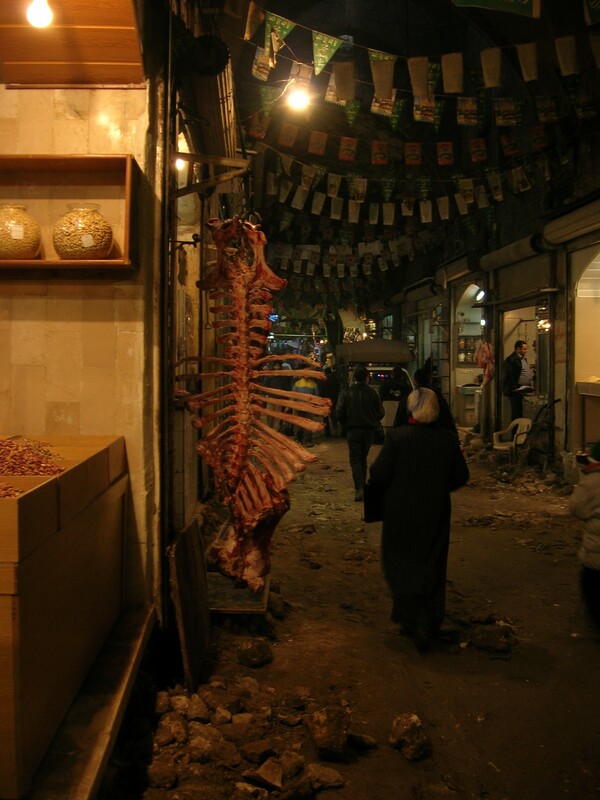 That first day in Syria I wander through the medieval market, the souk al-Madina. I try but fail, to hide my wonder and astonishment from the locals. In the meat souk the entrails of unknown animals are displayed in clear bowls, ready to be dangled into ordinary plastic shopping bags for a waiting customer. A cow carcass, stripped down to the bloody bone, hangs by its pelvis next to the street while a woman in a black chador walks past without giving it a second glance. In late September, 2012, a large part of the souk al-Madina, which was the largest covered market in the world, was destroyed by fire as a result of fighting between rebels and the government forces of Bashar al-Assad. I wander through the spice souk where new, intoxicating smells dance across my skin and invite me to follow them. In the gold souk the shops radiate with the brilliance of a pirate's buried treasure. Under the antique stone vaults men in thick sweaters smoke constantly while presiding over their display cabinets. In the enclosed, 15th century market time has paused in a moment that passed into history long ago. But even without a view of the sky I can tell it's getting late, and I'm getting progressively more lost. Finally, I find an exit and I emerge from the labyrinthine market into the deepening dusk close to the city's Great Mosque. It's pearl-coloured walls are illuminated from below so that it seems like a serene, opalescent ship gliding through the otherwise grey city. Rising above the mosque's courtyard, the 50 foot Seljuk minaret stands watch. From the tower's elegantly carved windows the salat al-maghrib, the sunset call to prayer, has just rung out over Aleppo's rooftops. In March, 2013, the tower was damaged by artillery fire and it collapsed into rubble. 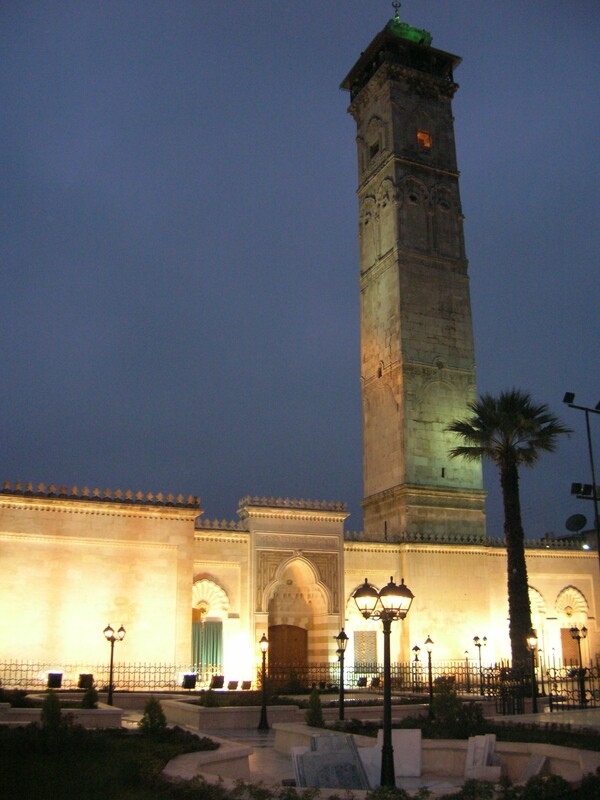 The minaret was built in 1095; it stood over the city for 918 years. Over the last five years, across this complicated country, it's history has been ravaged. 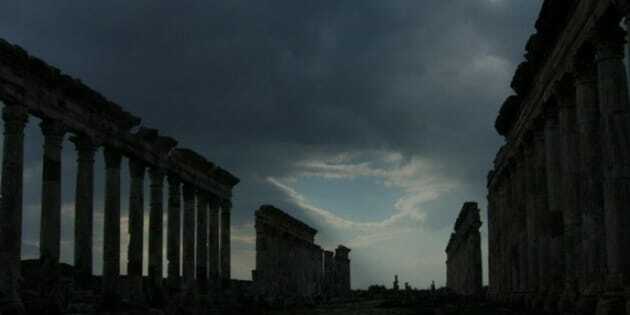 The Roman ruins at Apamea, which once felt the footsteps of Cleopatra, have been damaged and looted by treasure hunters. The 900-year-old Crusader castle, Krak des Chevaliers, has been hit by airstrikes and its architecture marred by bullet holes. Priceless, irreplaceable, pieces of a country's cultural heart; I saw these beautiful places before war scarred them or erased them from existence. And every day I consider myself damn lucky. At first, when I read about the destruction of Syria's treasures in the news, the collateral damage of a grim and punishing civil war, I felt relieved that my home, my treasures were safe. But that's a lie. The inspiration and the drive to create things beyond ourselves is an instinct that lives within everyone, regardless of geography. Building monuments to honour that which is divine, the passion to shape the world according to our own ideas of harmony and beauty; this too is common to all people. Eventually, I realized that what I read about in the news wasn't distant or irrelevant, but the destruction of my home, my treasures. It sounds trite and obvious but the true understanding of that relationship hit me like a thunderbolt. 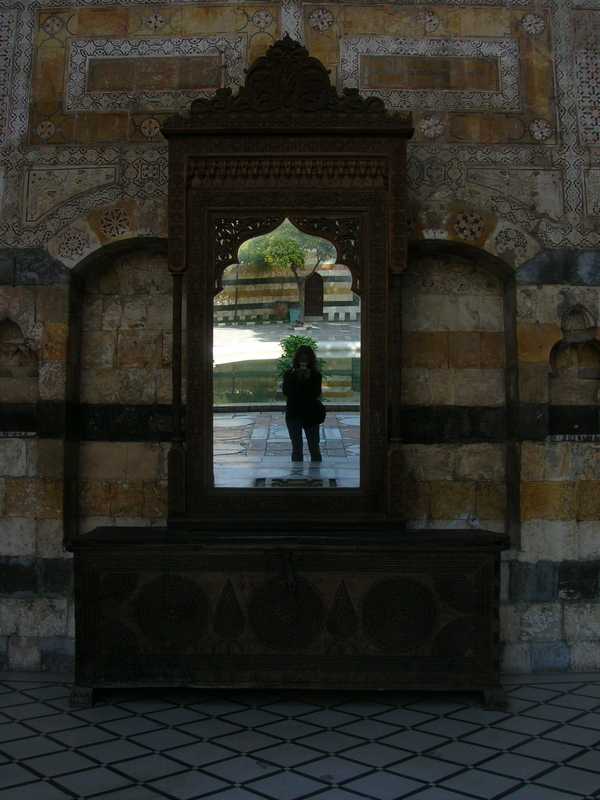 On my trip to Syria I touched the soul of a country whose past and suffering I can never understand. I walked in it's sacred places. And when I was done I got on a plane and came home to a safe, prosperous and ordinary life.